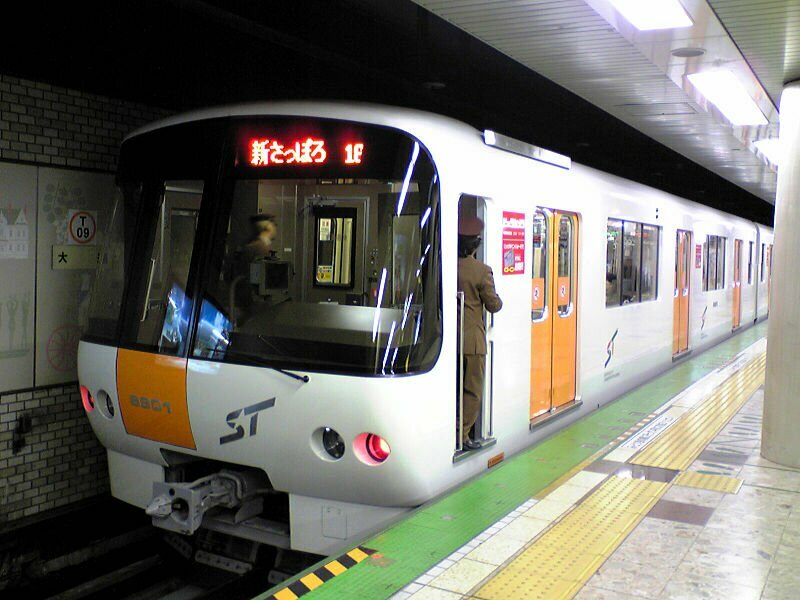 The Sapporo Municipal Subway is a 49 km long network, that operates on 3 lines, serving 49 stations in total. This underground system which began operations in the year 1971, operates in Sapporo, Hokkaido, Japan. Sapporo City Transportation Bureau is the body that is given the responsibility of handling its operations. The subway was the fourth in Japan after Tokyo, Osaka, Nagoya. Map of Sapporo Municipal Subway showing various lines and stations. Click on the map to enlarge it or Download the Sapporo Municipal Subway Map in PDF. The subway service starts operations around 6:15 am and runs until midnight. The frequency of the trains during morning peak hours is 3-4 minutes and 5 minutes during the evening peak hours. The frequency for the remaining day is around 5-7 minutes. The fares on the metro system are distance based. Riders can purchase single tickets from vending machines, and the fare ranges from 200 yen to 400 yen. Various types of cards are also available that suits the needs of the passengers. A Sapporo one day card costs 830 yen for adults and 420 yen for children, and provides unlimited rides on the metro system on the particular day. For weekends, discounted passes are available at 520 yen and 260 yen respectively. A Combination One Day Pass in addition to providing unlimited rides on the subway also provides unlimited use of trams and buses of JR Hokkaido Bus Jotetsu Bus and Hokkaido Chuo Bus on the stamped day. It costs 2000 yen. Another option in prepaid cards is a Sapica card that can be used on subway, tram and buses. This card accumulates 10% points for each use which can then be used for buying more trips. This is also a prepaid IC card and is rechargeable. It has a purchase cost of 2000 yen, out of which 500 yen is the refundable deposit. Children under the age of 1 get to travel for free. The Sapporo Municipal Subway offers park and ride facilities in almost all the stations, to make using the metro more convenient for its users. However, to make use of this service a parking fee is charged. This fee varies from 60-170 yen. Monthly parking passes are also available. Currently the system has 3 lines serving total 49 stations. 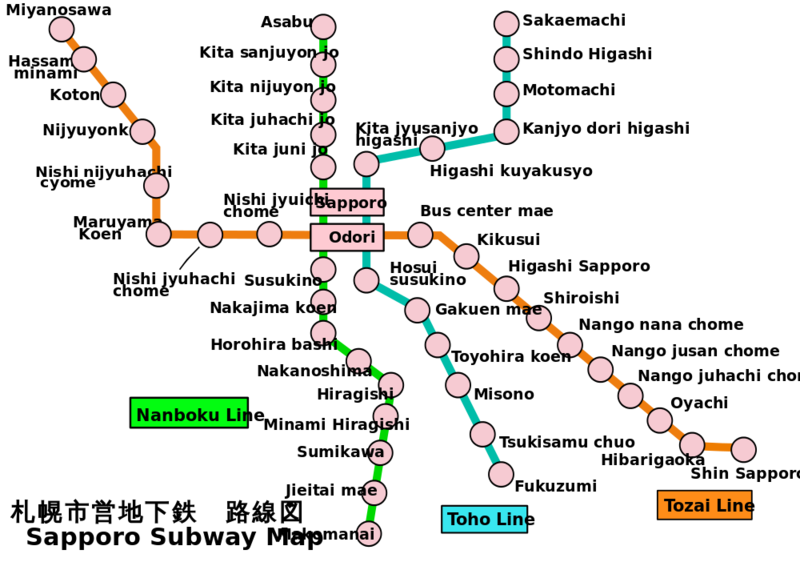 The subway system operates out of two main hubs: Sapporo station and Odori station. The lines are identified by its color, name and label. ● Green line – Nanboku line – The line started operation in 1971 and the metro operates from Asabu station in Kitaku– towards Makomanai station in Minami-ku. The line is identified by letter N followed by a number. This is the first line to be established in Sapporo and the line runs above the ground. The line serves 16 stations. ● Sky blue line – Toho line – The line started operation in 1988 and the metro runs from Sakaemachi Station in Higashi-Ku towards Fukuzumi Station in Toyohira-Ku. The length of the route is 13.6km serving 14 stations. The line is identified by the letter H.